Yet this time, is cooking something very different than usual if Thomas, to tell the news that will bring at Baselworld – svelandola a bit ‘at a time – a few hours ago has begun to show very strange objects that inspired the idea, obviously well before he decided the time had come to realize it. 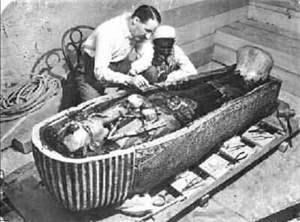 The first image concerns when Howard Carter discovered the tomb of Tutankhamun in 1922, then with the time machine with which every watchmaker and is obviously secretly equipped, Prescher leaps from the Egyptian king to our Giuseppe Verdi opera that was asked to write for the opening of the Suez Canal, the failure to achieve this goal occurred instead with Rigoletto. 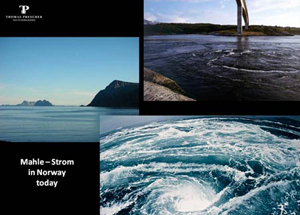 As an “Indiana Jones” of ‘ watch Prescher is weaving her mysterious adventure, including Egyptian mummies, the works of Vivaldi, the Suez Canal, and here also turn on “Twenty Thousand Leagues Under the Sea” by Jules Verne, Nautilus, and The Maelstrom – in Norwegian moskstraumen, “current Mosken” (read from Wikipedia). 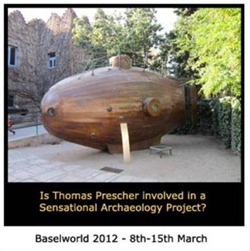 Prescher wrote in his website: “It seems that some archaeologists have found a large capsule containing a multitude of historical exhibits inside. The interesting fact is that each of these objects comes from a different era. Both the capsule and the objects seem to be connected between the gold and underwater naval technologies. The first surveys seem that the capsule has been used for storing stolen property… “. Tests carried out with carbon have found that a large number of these objects found were older than the date on which it was detected on their first use, many of them could never be older than 1867, but the tests with the carbon revealed the oldest of them has an age thousands of years. After having carefully examined the archaeologists have concluded that he found a collection of objects of a scientist who may have been able to have free access to the development of equipment that is not available at that time, and even today. A sort of Galileo and Da Vinci. And where will the independent watchmaker going with this? On a league mysterious, never used in the watch? On a new complication that inspired someone to watch these strange objects found? Everything can be, I must say that Thomas Prescher in some creations such as the Triple Axis went to apply a wristwatch concept never seen before. A bit ‘of fable and mystery does not make it much more interesting? Thomas recounts the eyedropper “fragments of his (new) story” to finally reveal it to Baselworld 2012.